Kotaku Japan is reporting that an official Pokemon game is on its way to the App Store and Android marketplace in Japan this summer. 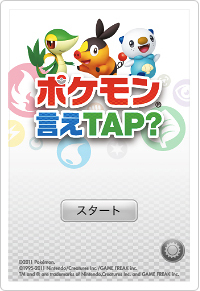 Provided the translations we’ve seen are accurate, it’s called Pokemon Say Tap? Apparently, it’s a rhythm game that has you tapping on Pokemon-themed cards in time with the game’s music. When it hits it’ll be available for $0, which should strike you as an uncharacteristic move for a publisher who rails against the App Store when promoting the its comparatively high-priced 3DS and its high-priced games. But this probably isn’t a Nintendo-published joint; rather, it appears to be a The Pokemon Company title. The Pokemon Company is an affiliate of Nintendo and has licensing and marketing power over the well-loved, well-travelled IP. So, not-official, but official. You see what I’m getting at? This does seem to have some amount Nintendo backing, though, if a listing on the game’s official JP page and a credit on the title screen itself is any indication of this kind of weighty stuff. I have a feeling the accreditation and promotion is more about “Hey, we’re Nintendo; we do Pokemon!" than it says about Nintendo’s plans for the App Store, which I’m almost positive there are none. Sorry, folks. Either way, an official Pokemon app is on its way. I wonder if Nintendo or The Pokemon Company will start cracking down on the immense amount of unofficial Pokemon stuff on Android and the App Store?